With the Summer season here, we spend more time outside than inside. My toddler still naps, and it can be hard to find a spot for her to nap while we are out. I wanted to find a nice and EASY storage travel bed for her to nap in if we are ever at the lake or park. My search was very specific. Of course there are a ton of travel beds around. But finding a travel bed that could fold up very small for easy storage, that would be tough! Before I start explaining the Peapod I do want to advise parents to NOT let their children jump on top of the PeaPod travel bed. My daughter did the 2nd day we had it and she bent a rod inside and it isn’t flat on the ground anymore. It is not meant to lay on top of so it would make sense that one of the rods bent. 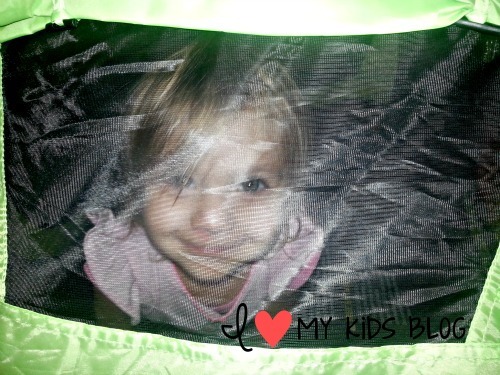 But I am adding this to maybe save some parents from having the travel bed a little lop sided on the bottom. (See picture BELOW) It still works great though! To start out, the PeaPod comes with a light weight sleeping pad that snaps on and off the bottom of the travel bed for easy cleaning. It is a machine washable sleeping pad and is perfectly padded for the comfort of your child. You could put the PeaPod on the concrete and your child could still sleep comfortably. 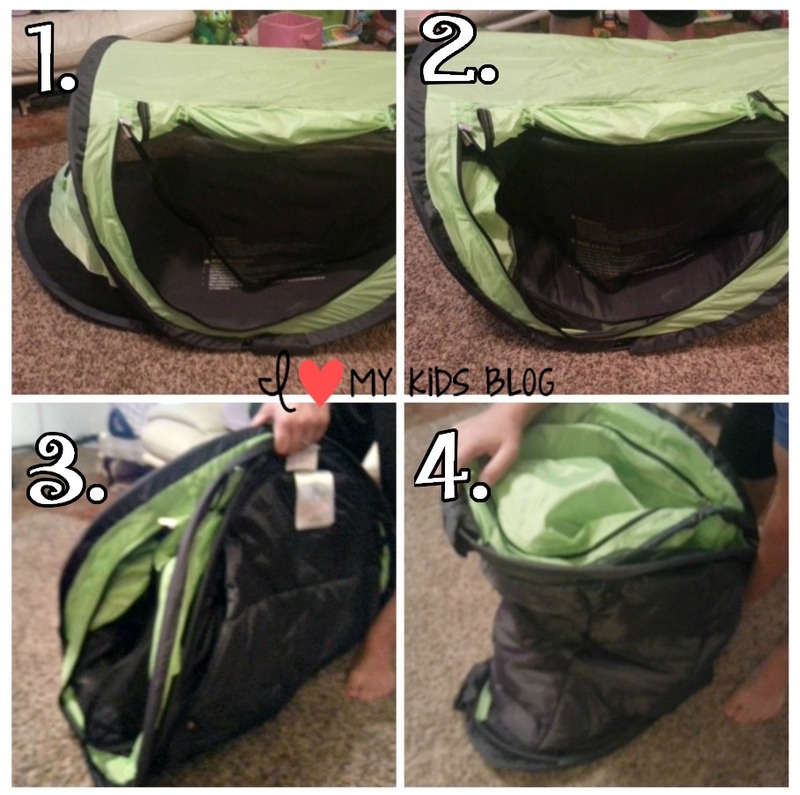 It has a zipper with mesh and another panel of fabric on each side of the travel bed, so your child can go in or out on each side. They have small windows on the opposite sides of the Peapod that also have a mesh netting. 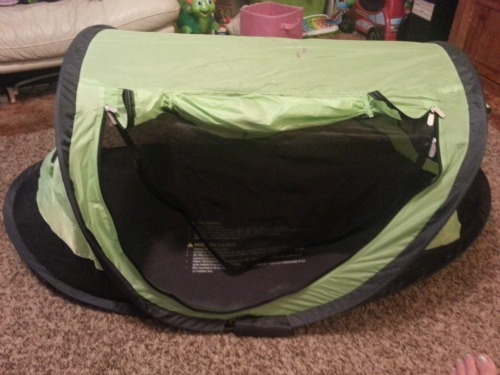 The mesh is great to have as it lets air flow through the travel bed easily, and it also keeps the child safe inside the PeaPod so you can see them and keep the bugs out of tent. The tent also has mesh netting on bottom layer of the PeaPod. 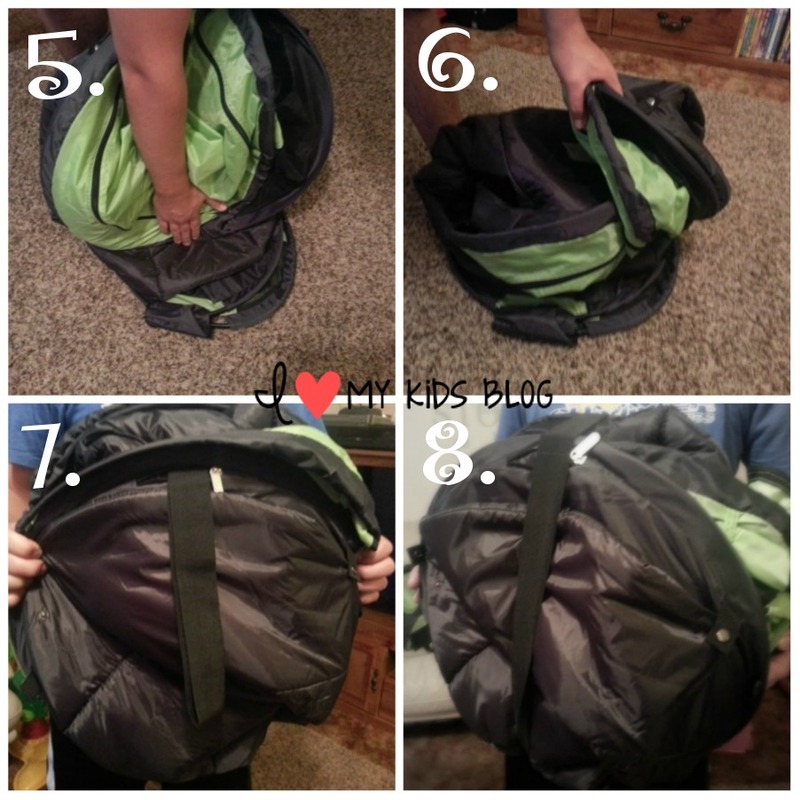 So if you choose to zip up the fabric part you’re child can still have air flowing through the tent so it’s breathable for your child. 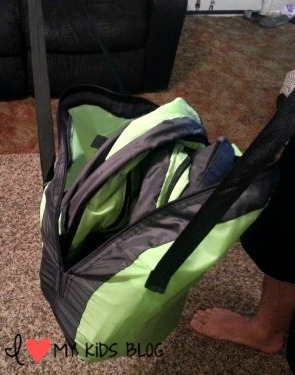 The first image I showed was of the small bag it fit in. You’re probably wondering how on earth do you fold it? I have step by step instructions for the way I folded it. 1. 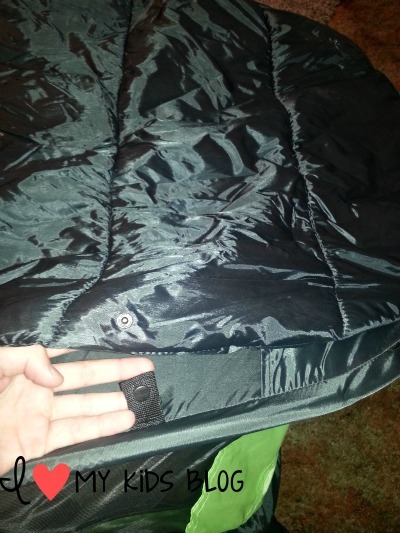 Lay your PeaPod travel bed flat on the ground. 2. Grab both sides of the PeaPod so it is in an oval type shape. 3. Fold it in half. 4. Flip it to the side. 5. Push one side down. 6. This is where it gets tricky, but it’s easy because it bends the way you want it to fold. Take the other side and fold it over the fold you did for #5. 7. Hold it and use the black strap to wrap around your now tiny round PeaPod. It really doesn’t take very long to fold. Nor is it hard. Like I said before it will bend right the way it’s suppose to be folded. And it fits back in the carrying case they provide for you! It has two button ties at the top to hold up both of the zippers if you want to leave it open. My daughter loves trying to zip it herself. She really does love her PeaPod Travel bed and begs me to take it out to watch a movie in it at least once a week. 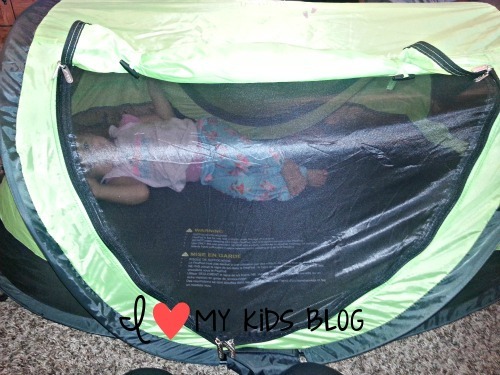 We love our PeaPod Plus travel bed from KidCo! If you want to purchase the PeaPod Plus you can do so through Amazon. Or you can go to their website and it will show where they sell their products. KidCo has offered to give away one FREE PeaPod Plus to a lucky person. Giveaway ends August 6th, 2014 at 11:59 pm EST. Open to US only. 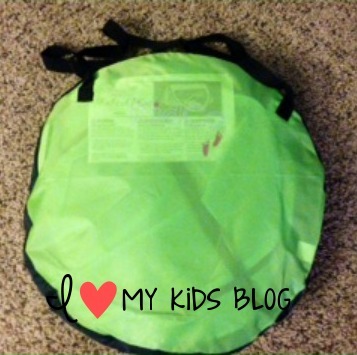 I have received the KidCo PeaPod Plus Travel Bed for free in exchange for an honest and true review of their product, all opinion are mine. I’d give this to my friend who travels alot to visit her in-laws with her baby. This would be great for beach days or camping! This would be great for beach days or camping! Thank you for being so descriptive in your review. I would take this to our cabin and when we visit the grandparents. This is so cute.I would probably use this all the time.At grandmas, the beach,in the living room. This us so cute. Beach time, grandma days, play dates. i would use this when we go camping and at nana’s house. I’d take it on trips to the grandparents’, beach, vacations. 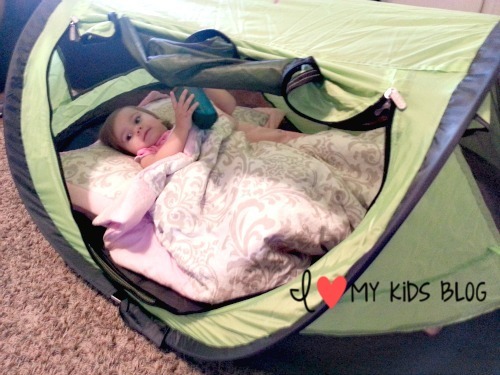 I’d take it on trips to the grandparents’, beach, vacations, or even to use as a fort! We still have a few more camping trips so this would be great. We go camping in our woods, and this would be great for the young ones. This would be great for our next vacation. We are going to visit Japan! This would be great for the cabin and other vacations! I wish I would have had this last week! My daughter would have loved it!! I love this, and it would be a perfect fit for any of my three great-nieces! My boys would love to use this in the playroom 🙂 We would also take it to the beach with us. I would use these for my house, The first grandbaby is due in 3 weeks. This would be so great anywhere with my 1 year old! 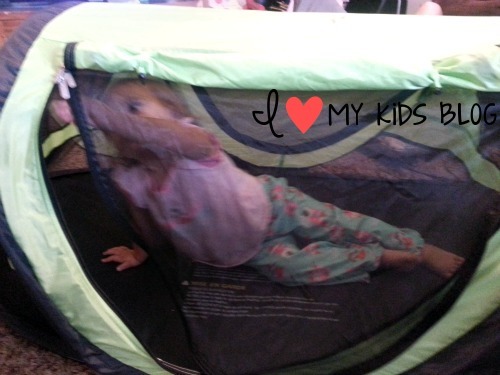 We travel out of state to see both of our families, and our peanut can climb out of the pack ‘n’ play so we are looking for something else for her to sleep in. Love this! Would be great for my baby niece to nap in when away from home. This would be the perfect way to ‘visit’ Grandma and Grandpa!! 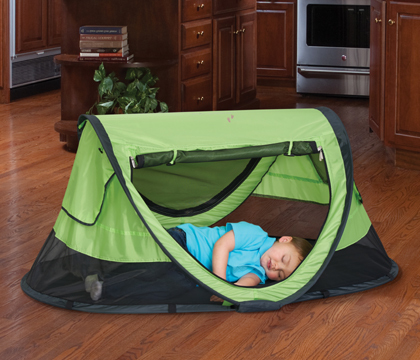 Kids love the idea of camping, and when visiting relatives sleeping areas can become a challenge. This would alleviate that issue and give the kids a super fun way to spend the night!! What kid wouldn’t love to have their own little tent to ‘camp’ in at Grandma and Grandpa’s house?? Take it to the lake, so the child could have fun in it and then nap. That is great for the beach! Fantastic concept! This could be great in so many situations!! I would use it when I am at my grandmother’s, cause she is so sick now, and this way it would keep from cross contamination. My grandson to my grandmother. Looks like the perfect solution. Any road trip out of town, picnicking in the park, and just about anywhere indoors or outdoors. This is an awesome, & useful product! I would use it when traveling, I am sure my daughter will feel secure in it and sleep well! 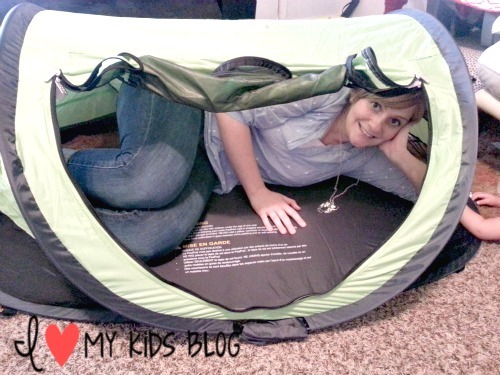 We love to go camping, haven’t yet taken my kids, but we’d love to! this would be great. We go camping ALOT! Actually just got back today! This tent looks so awesome! Great for little ones taking naps! My grandkids come to visit! This would be perfect for our cabin for my niece.